Hey Finkster..if its not too much trouble, can you update the "known Amiibo" thing up there? I know its probably a lot of work, but yeah. Even as an avid collector, I'm having a hard time remembering what is dropping when. Your imports are confusing the heck out of me, too! --And I just went to the Amiibo site; I'm pretty sure that there is a Pac-Man themed firesuit in Mario Kart, why isn't it reflected on their chart? Yeah, this is messed up; Mega Man DEFINITELY has a firesuit. IT'S AWESOME. It's been on my to-do list for quite some time. I will try to get to it sooner than later. And now to Mr_Mustache or anyone going to pre-order a 3 pack from Gamestop tomorrow… anyone able to bring a friend to get one for me? I'm over 20 miles from a Gamestop and besides the distance I can't make it tomorrow because I am house hunting with my realtor in the early morning (her only open time this weekend) and then even if they weren't sold out yet, I have to go to my cousin's immediately after so that I can participate in my cousin's bachelor party bus to a Tiger's game). There's a BBQ before that and I promised to be there and help as early as possible. So everything fell on this Saturday and I would absolutely appreciate if someone could buy a pack that I could guarantee I'd buy off them and cover shipping and everything. A bone-a-fide promise. Any generous takers of this deal? If the individual members of my family count as separate customers, I can pick up one for you! Assuming I'm able to get to the front of the line before they sell out, of course. I wonder if it's limiting one per household but I don't know. I'll send you my phone number so you can text me if you want to let me know how it's going to go. At worst if someone else was also able to help then it's just a simple cancellation but nobody else I've pleaded with can help yet, lol. So I appreciate you gesture and again, just keep me posted. It would be so kind of you. You can send me your number if you want. I heard it was one per customer, so we should be able to get more than one set. @DrFinkelstein Thanks for looking into that for me. I'm not a huge collector of these things, and right now Braxton is more into Pikachu and of course he loves the term "legendary Pokémon". I'll pass for now. Thanks again though. I'm working on the various amiibo images slowly. I think what I'll do is make posts with larger graphics and then put links in the OP for them (or use smaller graphics but those might still clutter up the OP more than text). 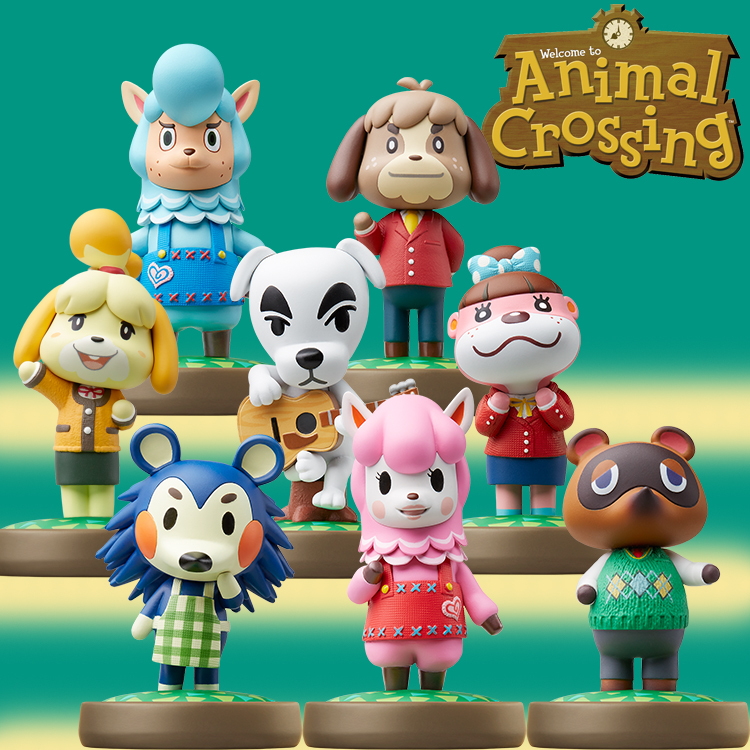 For now lets try this… the Animal Crossing amiibo. Snagged mine with no trouble whatsoever this morning. Well, at least today's nonsense happened on a saturday, when most normal people are off. Sadly, that doesn't apply to me. There seemed to be about a dozen or so people in line at 730 (waiting for 900) when I drove by the closest gamestop on the way to work this morning. Oh well. Once you don't have some (I'm currently missing 5) it becomes infinitely easier to miss out on others. Are the ones made available today only available through this 3-pack? And only at gamestop? Just wondering. My GameStop had 46 to give out, and there were about 10 people in my line. Which 5 are you missing? Ness, Robin, Lucina, Dark Pit, and I did not get the preorder for Palutena. And now these three. I thought about stopping after work, but I figured, why bother? It seemed very unlikely they'd still be available. A big thanks to Hero_Of_Hyrule for locking down a preorder for me when I couldn't go myself. I very much appreciate it. This is another example of the fine community this is. So, the wife was out and about this afternoon and stopped in a random GameStop. They still had preorders available for the retro 3-pack. Go figure. She ruuuuuulezzzzzzzzzz!!!!! I'm down to just needing Marth and Gold Mario. Woo! 3 pack is on gamestop now!!!! Go go go! It's still available too. Been that way for well over an hour. It seems the 3-Pack will be an easy one to procure. I like how this is going. B-but I got my Marth from YOU! I assume he's one of the amiibo you sold, eh? Booo!